Late last night our most rambunctious kitten scampered outside between my legs and disappeared into the night. He’s never been out for longer than a few minutes, and he had already wrestled his collar off. I have no idea when or if he’ll come home. I think he’ll come back if he can find the house again. 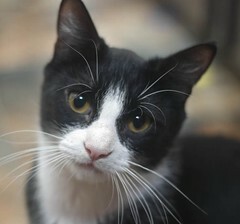 But at the same time he’s very friendly and would be an ideal stray to adopt. I’m gonna need more flyers.